All good senior management teams should be up to date with the latest changes in technology and security, which is why Redline’s Aviation Security for Senior Management course is the ideal choice. This one-day seminar is specifically designed to meet the needs of your senior management team whatever their field, from airlines, airports and associated support services including cargo agents, to in-flight suppliers and ground handling agents. All secure senior management teams should have a full understanding of the legal responsibilities placed on both their shoulders and those of middle management. With many key appointment holders entering aviation from industry at large, it is vital that they fully understand aviation and the legislative framework that supports it. 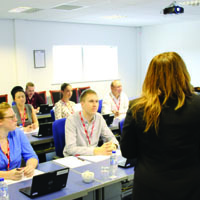 With speakers from key law makers to enforcement agencies and globally recognised leaders of specialised fields, Redline’s Senior Management course is fully supported by DfT ASD and is steadily becoming the focal point for CEOs, finance directors and operations directors across the aviation sector. The full list of speakers will be published prior to each event, so don’t miss out – call 01302 288360 today to book your place or complete the enquiry form below.